Cigars and Wine: An adventure with young men, experts AND AN EVENT! 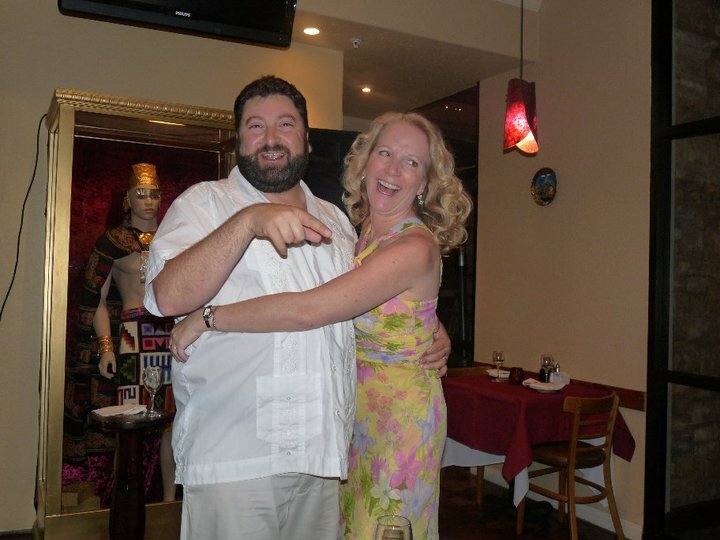 Cigar Dave and Me the last time we took over Inca Bistro! For years, the Valencia Cigar Lounge and Eve’s Wine 101 have wanted tocombine forces for a fun, exciting event. Well, here it is! And the best response to their photo was: “There is something about watching a man smoke acigar. Cigar smokers truly take great pleasure in smoking, a sight tobehold.” Susan Southard, Central Maryland Taster’s Guild. Anyway we settled in with a bottle of Bordeaux, ChateauLafont Menault 05 (from the Pessac Leognan region of Bordeaux, killer vintagemostly Cabernet Sauvignon, Cab Franc & Merlot) while waiting for thepromised rain under the wide expanse of Valencia Wine Company’s grand blueawning. Then these two young dudes showed up. Jacketless. Bullet-proof chests fresh from the bench press and ashower. And one final thing, athick cigar was dangling from two of their four well-muscled extremities. We contemplated moving back inside and sitting withSoroptimist Darlene and her great-story-telling husband, Robert, but we didn’twant to be inside in case the little Cherub showed up with a boy slithering byher side outside. I told my husband Eddie that we should just give in to it,brave it out, rely on the breeze. In the past I would hide inside the bars, complaining that I could stillsmell the smoke. What’s the point? The wine world is-a-changin’. And we can either grow old without itor grow young with it. What we feared most…didn’t happen. The young men ordered a bottle of Midnight Cellar Zinfandel06 from Paso Robles to pair. Theydidn’t get boisterous. And…whenthe sweet smell did waft our way we didn’t grumble. We gave in, or caved in, and went with it. And you know what? It made us stronger. Bolstered by my new found appreciation I stealthilyapproached the young whipper-snappers. I asked why they didn’t have a lighter as their wooden matches keptbeing blown out: “Because butane negatively affected the taste of thecigar.” Well. 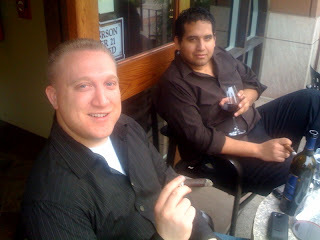 John and Sheldon, self-proclaimed computer geeks and both onFacebook, were new to drinking wine and smoking cigars. They liked to relax for an hour asoften as possible with both. Ilearned a little about them and their interests that night; glad the winddecided to blow their way after all. I was mystified, as I often am, by the new face of winedrinkers. Fresh-faced and scrubbedup, ready to dip into the deep end of the wine pool. And very comfortable with what they are doing. Still, with mounting interest, I asked proprietor GuyLelarge what he would pair with cigars and he said 10 year old Ports. “Ports and Cigars have, since theday’s of the Romans, the perfect complement after nights of debauchery! And Iam being serious.” (Lelarge is pictured holding the Dows 20 Year Tawny Port) Kevin Osborne, winedirector, also recommended the aptly named “cigarzin” by Cosentino wines. Another expert opinion came from Larry Elletson,Co-Director, Tasters Guild, Central Maryland: “There is no ‘right’ answerbecause everybody’s taste in regard to both cigars and wine are unique. If one liked a port or another sweet wine (stickies as we call them), Iwould match the port with a dark maduro wrapped cigar as the madurowrapper does a bit of sweetness to the cigar. Forget about trying to match a white wine with a cigar….the cigar will just overpower the wine. Although I may be tempted to try some of the small cigarettos fromMacanudo with a fruitier white like a Pinot Gris….. that way the cigarwill not overwhelm the wine as it is a relatively a short smoke. Look for a wine that has a bit of earthiness and smoke inthe nose. Enjoy the flavors of both the wine and the cigar as they comeacross the tongue. Take time to enjoy both as neither should be rushed asthe flavors and nose of each will change over time. So, in case this is on the Internet before Sheldon and Johnever get back to me, I’m thinking of trying Mitch Cosentino’s Zin in about twoweeks when the store is going through their remodel and adding more livemusic. Now, I’m not sure I’ll goso far as smoking a cigar because…well…being a blond I inhaled when told nottoo. Little to old to shake thatoff again. I wrote this a long time ago! But had fun!